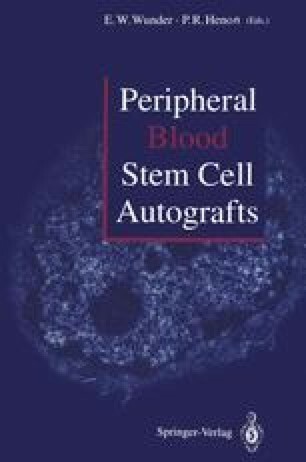 Peripheral blood stem cells (PBSC) may be obtained by apheresis, processed to reduce the volume and the mature blood cell contamination, cryopreserved, and then thawed for autologous infusion [1–3]. Eligible patients include those whose marrow is likely to be contaminated with malignant cells or who have received prior radiation therapy involving the iliac crests traditionally used for marrow harvest [4–6]. This paper describes the methods for processing, cryopreservation, storage, and infusion of thawed PBSC at the University of Nebraska Medical Center.